Extra durable heavyweight sheet protectors provide permanent storage for frequently used materials. A4 size is perfect for international sized documents. Extra durable heavyweight sheet protectors provide permanent storage for frequently used materials. 11 3/4 x 8 1/4, A4 size. Photocopies won't stick. No sheet punching necessary. Acid-free. Clear finish. 50/BX. C-Line's sheet protectors are designed to protect your documents day after day, no matter how often they're handled. Sheet protectors offer an invaluable way to store hard copies of documents, reports and other important paperwork. Use sheet protectors in conjunction with three-ring binders to store, protect and conveniently organize your documents for easy reference when needed. Heavyweight Polypropylene Material --- Provides extra durability for permanent storage of frequently used materials. Documents stay protected in 3-ring binders and resist tearing, even with heavy use. Polypropylene material provides acid-free protection with no photocopy transfer. Acid-free --- Ever have a document stick to a sheet protector or binder? That won't happen with poly material; the threat of photocopy transfer from the document to the sheet protector will be eliminated. This allows for your documents to be better preserved over time. Durable reinforcement strip --- To ensure that the documents remain in the three-ring binder, C-Line features a reinforcement strip along the side of the sheet protector that attaches to the binder. This extra layer of material provides additional protection and security for the document. A4 Size Document Storage --- The A4 sheet protector measures 11-3/4 x 8-1/4 and is slightly larger than the letter size sheet protector. A4 size sheet protectors have 11 pre-punched holes along the reinforcing strip so they will fit in A4 sized binders. They will also fit standard 3-ring binders. The A4 size is recognized as the standard paper size adopted by the International Standards Organization and is used all over the world. 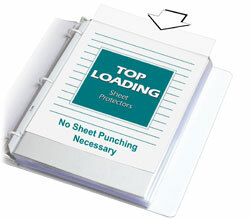 Top Loading Design --- Provides great protection and ease of use. These sheet protectors are closed on three sides and the paper is inserted from the top. They feature a sealed binding edge that is punched for binders so there is no need to punch holes in your documents. The top loading style allows a document to be added or removed from a sheet protector without having to remove the holder from the binder. Clear Finish --- Clear sheet protectors are preferred by the majority of sheet protector users in the United States. A clear protector offers a sharp, transparent finish. It is perfect for showcasing your materials and makes presentations appear bold and bright. Eleven-hole Punched --- Sheet protectors are eleven-hole punched to fit in multiple binders including those for A4-style pages. Sheet Protector Special Features: Acid-free A4 size sheet protector eliminates photocopy transfer and can be stored in various styles of ring binders. Suggested Use: Oversized, extra durable storage for A4 sized documents and reference materials.